Beautiful and functional watch jewelry boxes and cases. From 2 watch holders to 20, we have a large selection from which to choose. Top brands: Ragar, Reed & Barton, Budd Leather, Jere, and More! Wood Watch Box with Lock. Display Window and Storage for 10 Watches. 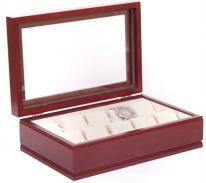 Watch jewelry boxes and winders display and protect fine watches. 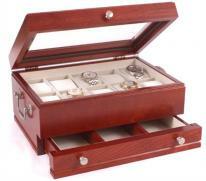 We offer watch boxes and cases in large, leather, wooden and key lock styles. Many of our watch boxes feature glass display tops, removable watch pillows and luxurious linings. Our precision watch winders keep a fine watch running smoothly. If you have a watch enthusiast on your gift list, they will love a watch box or watch winder! All leather watch cases and watch winders qualify for easy 30 day returns and 1 year product warranties. At Chasing Treasure, we understand that jewelry boxes are not just for necklaces and earrings. This is why we have our curated collection of heirloom quality jewelry boxes designed to hold watches and winders, too. Our watch jewelry boxes hold anywhere from 2 watches to 20 of them. They also hold other pieces of jewelry in separate drawers and compartments, so you can keep your cufflinks and watches all in one convenient spot. 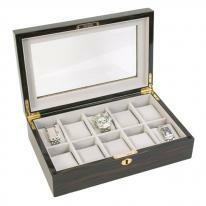 Our handsome watch jewelry boxes come with a variety of different lids and closures. Some have locking cases with latches that are designed to keep prying eyes and fingers out. Many of our locking cases are small enough to take on the road when you travel. We also have collection of watch cases that are not meant for traveling, but are the perfect size and style to place on your dresser or in the closet, too. Some have glass-top lids so you can see what is inside and keep the watches free from dust. If you have more than one watch jewelry box, the glass-top lids are perfect choices. Some of our watch cases have smaller watch rolls for women’s watches, while other cases have the larger rolls. Our collection of watch boxes are heirloom quality jewelry cases designed to last for generations. Many are made of lovely hardwoods like mahogany, walnut, burlwood, and cherry. They are all in designs that fit in all types of interior decor. Some have traditional hardware and others are designed to have clean lines without any accent hardware at all. 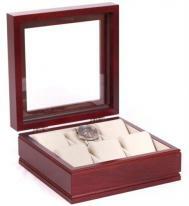 There is truly something for everyone in our collection of high quality watch jewelry boxes. The watch cases at Chasing Treasure are perfect choices for gift giving. Anyone with at least one watch would be happy to have a watch jewelry box to keep their precious treasures protected from dust and scratches. 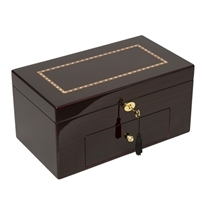 Each jewelry box is lined with soft fabric that is meant to prevent scratches and wear. When jewelry pieces are put in their designated spaces, jewelry lasts longer than when pieces are piled up on trays or thrown into bowls. The watch pillows keep their shapes with filling and suede-like fabric. Our watch jewelry boxes are proudly made by manufacturers located in the USA. Mele Jewelry Boxes is one of our favorite designers; this company has been creating heirloom quality pieces for over 100 years. American Chest Company is another of our favorite watch box manufacturers. Each of our watch jewelry boxes comes with a 30-day return policy and a one-year warranty. Our customers appreciate our return policy and the warranty policy, too. Watch jewelry boxes are good gifts for a variety of different situations. For example, if you plan to give a co-worker a new watch for retirement, why not give him a small jewelry box to store it in . They are good choices for anniversary, birthday, and Christmas gifts, too. Since men like to wear jewelry, these items are a good choice and will be appreciated for many years to come.